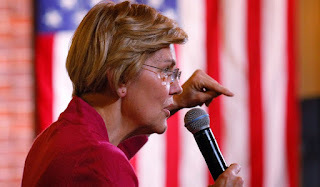 Senator Elizabeth Warren has long been openly contemptuous of American business. She proved it yet again l by publishing a dangerous and uninformed screed in the Wall Street Journal outlining a proposal that, if implemented, will shake markets to their roots. Like many proposals for radical reform, her Accountable Capitalism Act would destroy the institution she says she wants to save. The bill’s central provision tells the whole story: all corporations whose annual revenues exceed $1 billion dollars would be required to receive a federal corporate charter to remain in business. Those charters will come with conditions attached, to force corporations to pay due attention not just to their shareholders, but to their employees, suppliers, and their local communities. "Stakeholders". One of my least favorite words. In other words, those without Taleb's "skin in the game". NGO's and other busybodies. Unfortunately, I know otherwise bright women who would vote for this dimwit because "It's OUR turn!"